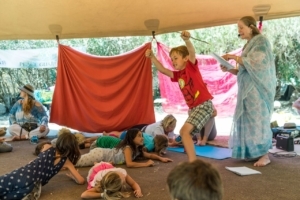 Little Bhaktas and their families are invited to explore, learn and grow in this beautiful safe space. Come and play with us; Yoga Classes, Art & Crafts, Workshops, Sing-alongs, Puppet Shows and more. Located at the heart of the festival in the Sacred Grove. Please keep in mind that this not a child drop off, but a Bhakti family participation space. — are they on board for Bhakti? Stay tuned for class descriptions. Kid’s Land is sponsored by Sunwarrior – a family-owned health food company committed to making only the best plant-based proteins and superfoods. The company’s mission is to nourish and transform the planet, one warrior at a time. Sunwarrior sources only the finest ingredients from around the world and provides the cleanest and most powerful foods rich in antioxidants, vitamins, minerals, enzymes and phytonutrients. For more information, visit www.sunwarrior.com.